The Exmoor Club Card scheme has officially launched. The media release has just gone out! Feel free to spread the word – and if you are interested in becoming an agent or a partner, please get in touch. Click here to order your card! Exmoor.– The Exmoor Club Card has been launched with great deals across Exmoor for locals and visitors alike. Offers range from discounted entry at local attractions through to deals on accommodation, cookery classes and locally based online stores and even web design. 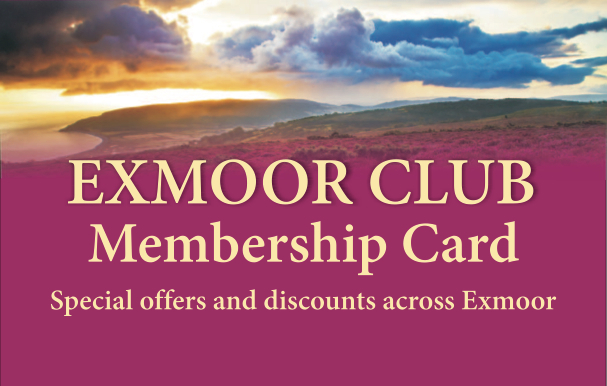 Exmoor Club Cards cost £25.00 per year. 10% of the amount raised will go into a special fund which will be used to pay for a special project or event on Exmoor. Cards are available online at www.exmoorclub.co.uk and at a growing number of local outlets. The card scheme is part of Exmoor4all which was set up by local events & PR company CultureLine earlier this year. Exmoor4all serves as platform where the public can share their photos, stories and experiences of Exmoor. So far, the website www.exmoor4all.com has had 13,000 hits and is being followed by people from all over the world, including a number of travel blogger who engage regularly with Exmoor4all. The National Trust’s Holnicote Estate is one of many Exmoor Club Card partners, offering 20% discount on purchases in the Selworthy Tea Room and NT shop. NT Knightshayes has come on board with a 2 for 1 offer on admission. Exmoor Zoo is another local attraction involved; local providers like Exmoor Adventure and Experience Exmoor have also joined the scheme. A regularly updated list of offers and deals is available at www.exmoorclub.co.uk.